There was another Marathon weekend at Phoenix Art Workshop this past weekend. This time, there were three sessions. One evening one was 30-minute costumed poses and the other two were 5-hour sustained poses. The first long pose went well but the next day the model woke up ill so the planned set-up (alas! no Medusa!) did not happen. However, Lawrence saved the day by coming in to pose and some very nice work resulted. I haven't photographed anything yet so this is Wanda from a previous Marathon. Coloured conte' on pastel paper. It is always interesting to paint with other artists and see all the different interpretations. The weather is wet and windy today - quite miserable out- the kind of weather of which my grandmother used to say "It's not fit for man nor beast- send Father". Nevertheless, I delivered the re-done "Abandoned Farmhouse" and it was happily received. The owner says she didn't think it could be improved but now she sees it has been. So that is a happy ending. .....and it may be wet out there but it is easy to get around. Last week, with the snow, we weren't sure if Life Drawing would take place so the model ended up being cancelled. Some of us went anyway. Happily, although a lot of Richmond had an electricity blackout, the lights were on in the Art Centre. We improvised by taking turns posing for 10 minutes each and had a successful drawing evening anyway. This is Marv, posing with a hat on, as befits one of "The Men in Hats." 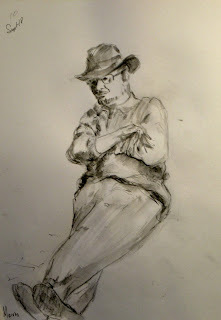 the 10-minute sketch was done in water-soluble graphite pencil. I don't do watercolours now- except maybe in a sketch book- but I did some years ago. I don't remember all the particulars of this painting. I'm sure I painted it en plein air - and maybe I was running out of time -?- but looking at it later I felt the foreground just wasn't interesting enough and was too flat. I offered a painting exchange to the owner, but she liked the old deserted farmhouse. Then it was loaned to someone else. Then she got it back and said I could "touch it up" if I wanted. So, figuring it had my name on it and I should try to "fix" it, I borrowed it back. It was a challenge doing watercolours and realizing they would dry lighter whereas acrylics dry darker, but I ended up happier about it. Then "in for a penny, in for a pound" as my grandmother used to say, I knew it needed re-framing as the mat took too much from the edges and didn't give the painting breathing room. Anyway, it is done now and I plan on taking it back this next week. I'll report on the reaction. It was nice to work upstairs where it is a little warmer - so I worked on the collage and got it done. It is very time-consuming but interesting work and I ended up putting a few different twists on the actual model set-up. He got a tropical garden - or is a conservatory?- to be near. I think he looks like a magistrate or official. Could he have some power in a more tropical place? Or was that a winter wish on my part? At any rate, I have decided that one of the few perks of winter is hot chocolate! I'm not sure if this collage will be "shown". I think it needs to be under glass and that is a whole other level of expense. I may look into some kind of interchangeable frame and then just always do collages the same size. Here we go with 2012- and new experiences in art. "Nets" is a recent painting that was a bit of an experiment. It ended up being really interesting to do and at our Guild critique just before Christmas, the guest doing the critiques liked it and said it was "controlled chaos". I'm thinking of doing something else almost as complicated and using the same approach, which ended up being almost meditative. I worked a section at a time, not thinking of anything beyond the section I was working on. At the tag end, I did some work pulling it together but it didn't need a lot. My aim for 2012 is to do lots of drawing in different media and to just have fun with painting and see what develops. Currently I'm doing a collage and will post it when it is finished.